How to Bleed Brakes with Completely Open System? 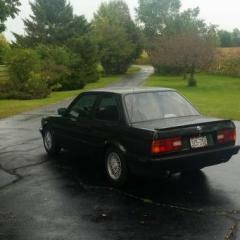 So I have to replace the brake booster on the E30, which means completely removing the master cylinder and everything. I've read and been told that the master cylinder will have to be bench bled. I've seen some videos on doing this, where you plug the outlets and manually pump the cylinder. My question is, after bench bleeding the master, how do I attach the brake lines without having fluid pour out, loose pressure, etc? It seems that after pulling the plugs out, fluid would start pouring while attempting to attach the lines. Has anyone bled a system being completely "dry"? Would like to do this before trailering it anywhere again because I wont be guaranteed to have a winch to get it off a trailer and also just have brakes in the car again. @m42b32 was able to hook me up with a working booster, so I'm gonna try and do this tomorrow as it should be decent outside tomorrow. I add some fluid to the MC, move the piston by hand primarily to get the seals slathered up so you dont wear/tear them during the insane pedal pumping action that follows. I have never bench bled and have never become a crackwhore. So you just do a little "bench bleeding" by pumping the piston a little bit to get some fluid in the master? Then install the hard lines to the master and bleed the brakes as normal? Open bleeder furthest from master, pump fluid through to remove air, close bleeder, move to next, repeat? I find that pumping the pedal with the bleeder closed/beween bleeds to be very effective at helping with a quick and complete bleed. The "bleeding" of the master cylinder was my main concern. Honestly the biggest thing with bench bleeding is to help avoid running into a situation where there is trapped air in the master cylinder that won't be easily bled out through the calipers. When I install a new master I'll go ahead and do the bench bleeding procedure and then leave the fittings and hoses on until I have the master mounted in the car and ready to hook up the lines to avoid it all coming out and making a mess. You can probably get away with skipping the bench bleeding as most of the time your going to be able to get all the air out of the system no problem, just a easy precaution to avoid any troubles. Is that tool something that can be bought locally? Looks like a screw driver with a ball at the end of it? I'll probably use something like snaps method.